EU-supported for the lif-E-Buoy project has enabled researchers to undertake a feasibility study into the production of the first commercial hydro powered electric vehicle (EV) charging stations. While the steady flow of water lif-E-Buoy utilises fits well with the overnight charging of stationary EVs, especially appealing to householders without a garage-held charger, the technology can be upgraded to match the faster charge requirements of taxi and bus fleets. Preliminary partnership discussions with fuel retailer MOL Group, operating almost 2 000 petrol stations across Central and Eastern Europe, has further convinced lif-E-Bouy that its solution will become integral to mobility plans for smart cities. Positioned against the direction of flow, just above the riverbed bottom, lif-E-Buoy operates similarly to existing hydro generators, but with its innovative design affording numerous advantages. Existing turbines have large rotor diameters and short bodies, meaning they have to be placed in deep waters. However, as project coordinator Mr Vilmos Willisits explains, "With our generator, the rotary motion converter has a special blade system, arranged in a cone-shape, reducing its diameter and elongating its shape. This allows conversion without loss of torque, usable in shallower rivers." lif-E-Buoy can be installed in riverbeds with widths of 20 m and at water depths of 4 m.
The current generator does not suffer from wearing problems related to mechanical friction, as it does not use coupling accelerator gearing, but instead the so-called louvre system to transfer the energy. These frictionless bearings offer longer lifetime for parts, reducing costs. While lif-E-Buoy is fixed to a stabilising structure, its in-built automatic buoyancy allows it to move into stronger currents. The running water generates a torque on the rotor that drives the electric generator, with the electricity generated transported along a cable to the river bank to be fed into the local electric supply grid. Owing to the minimal infrastructure requirements, the device can be installed using a crane and can be easily, and cost-effectively, relocated or repaired, also minimising the impact on the surrounding ecosystem. At the European Commission's 2011 Transport White Paper's core is a drive for less congestion and fewer emissions by 2050. Those twin initiatives have resulted in commitments to phase out conventionally fueled cars from cities, transfer medium distance intercity passenger and freight journeys from road to rail and waterborne transport, while reducing CO2 emissions by 60 percent. Without deeper EV penetration, current fuel efficiency standards and clean energy benefits cannot be met. With cost of use over an EV's lifetime close to competitive against internal combustion engines (and the cost of lithium batteries ever reducing), cost parity is only a few years away. But while this makes mass adoption more likely, the main challenge will be establishing widespread charging infrastructure. 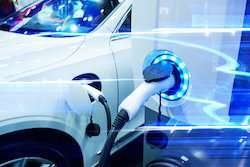 Fortunately, there are plans for a commercially viable Charging Point network and with typical payback for network operators within the five to eight-year range, this is now beginning to attract investment. As Willisits says, "The EU's policies are an invitation to break the shackles of transport's dependency on oil, without sacrificing efficiency. Lif-E-Buoy will help provide green fuel for transportation! The EV market offers a huge opportunity for us, the only unknown is how EV regulations might evolve over time."